After a long and unintended hiatus, it's time to dig back into the nesting around here. Prior to summer, I was linking up with Jules and her William Morris posts nearly every week. Jules kept her series going through the summer months, but I took a break -- it was hard enough to keep my house clean(ish) with the kids home on vacation, let alone tackle new decor or organization projects. But now it's September and I'm back. With gusto. And here's what it looked like, immediately post-drapes: Very bright! The drapes came down at the end of May, and that's how the windows remained, until the beginning of August. We had mild, breezy weather for most of June and July, with temperatures staying under 90 degrees. The living room, which faces south/southwest, got mighty bright and warm by late afternoon, but it wasn't too much of a comfort problem. But when the weatherman forecasted a big warm-up for the first weekend of August, I knew it was time to get some blinds installed. Off we trekked, first to Wal-Mart, where I could swear on my first-born that I've seen bamboo blinds before -- and I could also swear I've read of other bloggers and designers referencing the Wal-Mart option. But there was nothing even close in their aisles. Then off to Home Depot, where the only bamboo blinds were off in the tiny section of "outdoor blinds." They had some that might have worked, but they were too big, and cutting them down wasn't an option. Finally, at Lowes, I found what I needed. They were by Levelor, and too big, but the Lowes employee was able to put them in the nifty computerized machine that saws the blinds, still in the box, down to your specifications. Also new are the two faux-flokati pillows on the sofa. 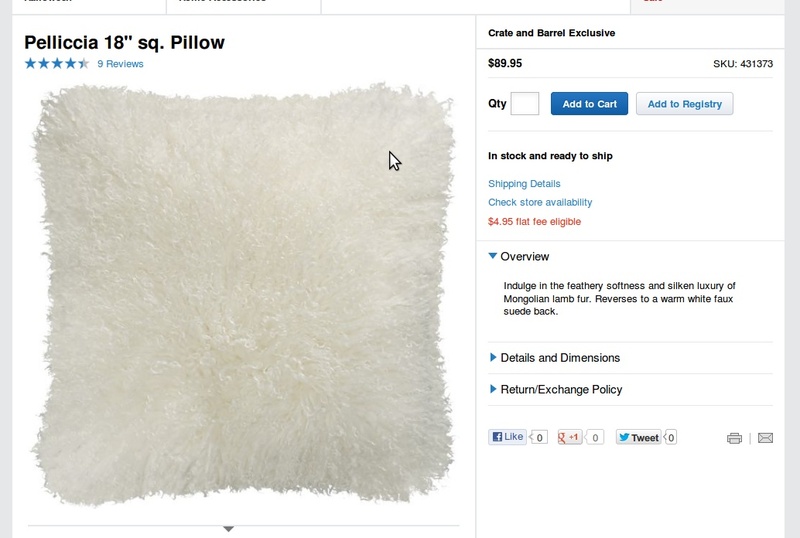 I'd been looking for plain, modern-looking white pillows off and on, and finally found these last week at Home Goods. But as the year tumbles down into the busy new school year and the holidays, that project will have to wait until next year. For now, I'm very happy with this space, and I know I'll have fun "autumn-izing" and changing out the beach-y accessories. What passes for "autumn" around here should arrive just in time for me to bust out the Halloween decorations. Love the blinds! They pick up the color in the coffe table and the wall unit, really pulling everything together. It is amazing how different the room looks with just changing the window treatments. I really like the blinds. Thanks, May. Sometimes it's subtracting rather than adding that makes the biggest changes! Ah, definitely need your privacy in the bedroom! Luckily my living room windows just look into my fenced back yard, so it wasn't a privacy issue when only the sheers were up. I love bamboo blinds! I've had them in our last five houses (except our current house, which came complete with hideous vertical blinds I won't replace for the short amount of time we'll be here). I think they are a great way of bringing in texture and natural elements in a subtle way. They look great in your room! Thanks, Lisa. And UGH on vertical blinds. I grew up with them in our apartment, and then had them in our first house as a couple. Evil things.